The finest girl Nigeria organization last night officially released the first barge of the 2014 grand finale contestants to the press at the Transcorp Hilton hotel 11pm. The media briefing was attended by the FGN President Mrs. Mary Anyaole Johnson and other FGN officials like the CEO himself Barry Avotu Johnson 1st who had since been in makurdi the benue state capital the grand finale host city to put finishing touches on the arrangements to host the 7th edition in a grand style. 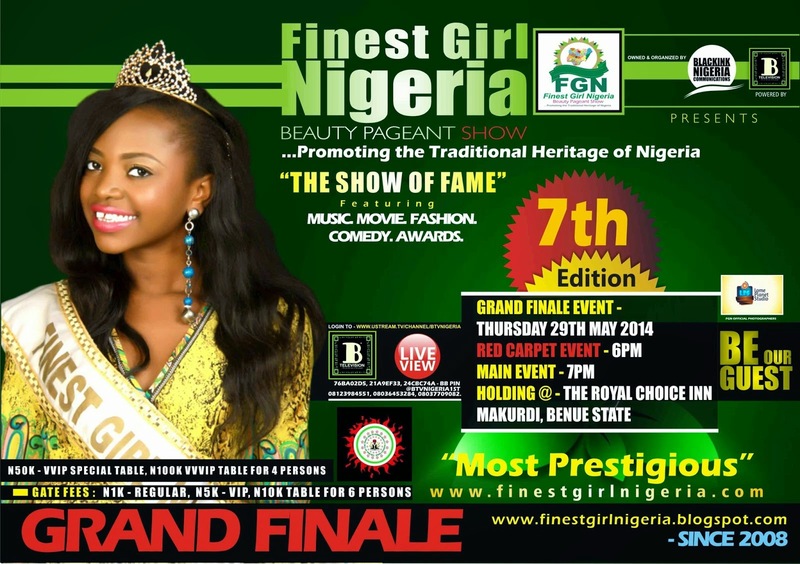 the FGN event is celebrating its 7th edition in a way to promote and let the general public embrace a world class pageant with all the international values to stand tall in whatever standard anyone can put a beauty pageant. The event is designed with the same fire that the comes with international pageants like the Miss World, Miss Universe and Miss America vis avis the credibility and prestige that follows the pageant industry the world over. the most interesting aspect of the 7th edition of this event is that the overall winner of this years edition is billed to represent nigeria at the world version that is also designed to hold in 4 four state accross nigeria. in december 2014. We invite the general public of Nigeria to watch out for a classic pageant come 29th may at the royal choice inn hotels in Makurdi starting from 6pm with a red carpet reception featuring Nollywood actress OMOTOLA JALADE AKENDE, DANNY YOUNG, ZAAKI ADZAY, IDAGO, BIG BROTHER’S KELVIN PAM, MALVIN, BREVERY ASU, DLUX, KLINT DA DRUNK, MR IBU, FRED BRIGHT, I GO DIE YOUNGEST OLDMAN PLUS 3 BENUE ARTISTS AND OTHER NOTABLE ENTERTAINMENT SHOWBIZ GURUS.